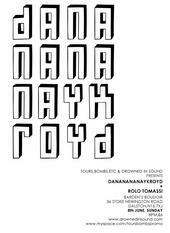 >Today’s New Band – DANANANANAYKROYD! A Glaswegian Triple Bill! >Wowsers – today’s band has it all. That is, all that makes us excited and tingly here at A New Band A Day. Firstly, today’s band is the third in the Fabulous Glasgow Triple Bill, hot on the heels of the wonderful ERRORS and super Q Without U. And then, secondly, and almost more groin-pulsingly exciting, is the Super Fantastico Name that they have – pretty much a prerequisite for getting on ANBAD, such are our soaring levels of idiocy. So then, here’s today’s New Band – DANANANANAYKROYD! Let their name roll over your tongue a few times, because it’s a whole truck-load of lot of fun to say it out loud. In many ways, it’s the perfect band name, appealing to those who like mildly novelty names (like us) and people who like dressing up as the Blues Brothers at any given fancy dress party. It may appeal to other people too, but we don’t have that wide a variety of friends, so we aren’t in a position to judge. Anyway, DANANANANAYKROYD‘s music is great. Considering they’re from Glasgow, where, by the sound of it, crafting great pop songs is taught in Infant School, this is no great surprise. They yell, grind and crunch their way through a bunch of swift and sneaky songs – check out British Knights (MC Hammer’s trainer of choice, fact fans) for a burst of super, howl-at-Button-Moon rock. Cleaning Each Other follows a pleasingly similar path of yell-blast loud guitars-thrash drums, and yet keeps the all-important melody churning through it all. Glasgow 3 Rest of World 0. Check out their Myspace page here! Posted on June 6, 2008 by Joe Sparrow. This entry was posted in Today's New Band and tagged glasgow, novelty triple bill, yelping. Bookmark the permalink.